The latest Rage 2 trailer does an excellent job of showcasing the enemies prowling around in the game who will have to get in line to face off against ranger Walker if they want to take him down. In this Rage 2 clip, Walker talks about beating up "that redneck mech," a "convoy of death," and even "this smug cliff." A "glowy cyborg," "that barrel," "this thing," and other enemies are just begging to make short work of this poor guy. "The whole f*cking world is out to get me!" Walker exclaims in the trailer. Yeah, it pretty much looks like it. Luckily the trailer is so hilarious and makes light of it so he can too. In case you've forgotten, Rage 2 lets players take on the role of Walker, the last Ranger, setting out to destroy General Cross and his mutant army. Firepower? Oh, he's got it by the boatload. Some of the weapons included in the game, like the Firestorm Revolver, Hyper Cannon, and Wingstick (the old standby) look particularly lethal, and we can't wait to put them all to the test. There are quite a few exploding enemies, which is totally up our alley (and may very well be up yours, too). "Whether Rage 2 will ultimately work feels like it will be determined by the number of activities available to the player. I didn't have enough demo time to get a full idea of just how much is available to do in the world, but with a much larger world to play with, id and Avalanche will hopefully provide plenty of things to do. The creative gunplay is intriguing, but it can only go so far. With driving being a central element, I'm also hopeful that the driving mechanics get another look, as the vehicles proved difficult to handle, especially in the derby." 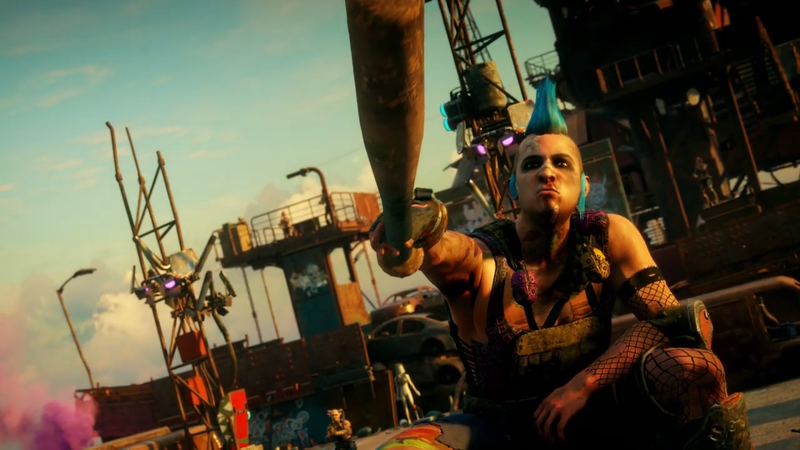 Rage 2 is coming to PlayStation 4, Xbox One, and PC on May 14.